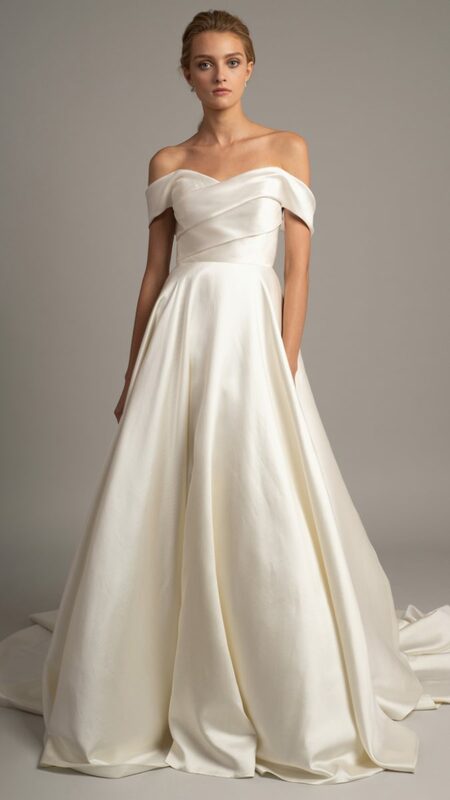 A look at the bridal gowns in the Spring 2019 Jenny Yoo Collection. 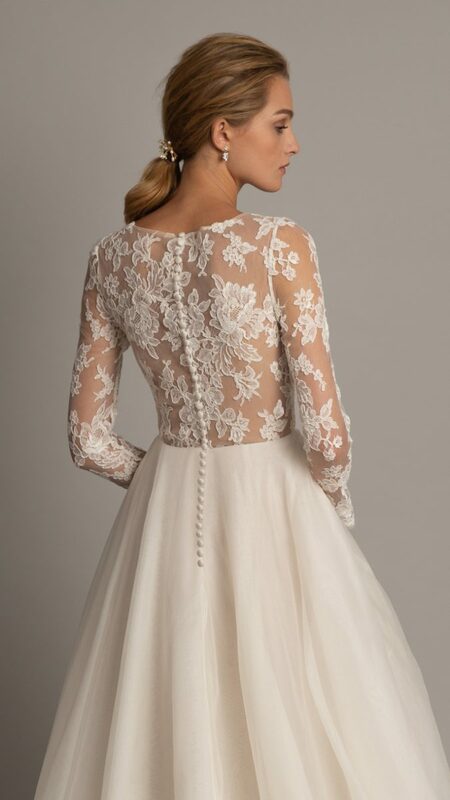 These new wedding dresses from Jenny Yoo will delight you with the interplay of textures and striking details! 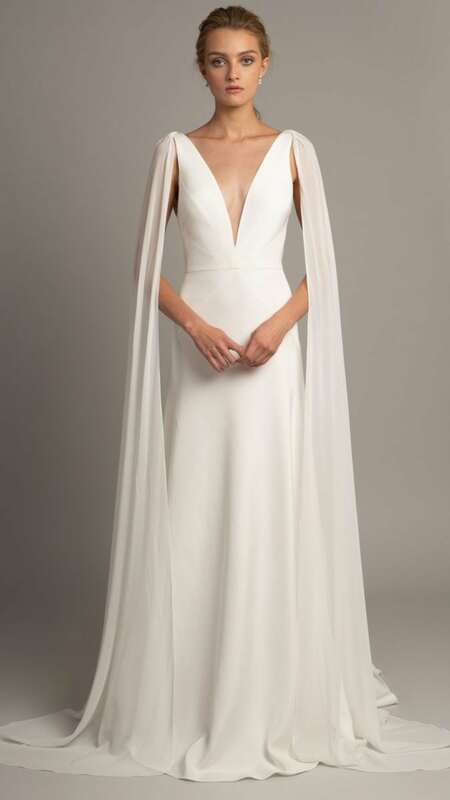 The Jenny Yoo Collection Spring 2019 bridal gowns are a beautifully modern collection that plays with shape and volume, and contrasts this with fitted bodices and stand-out details. 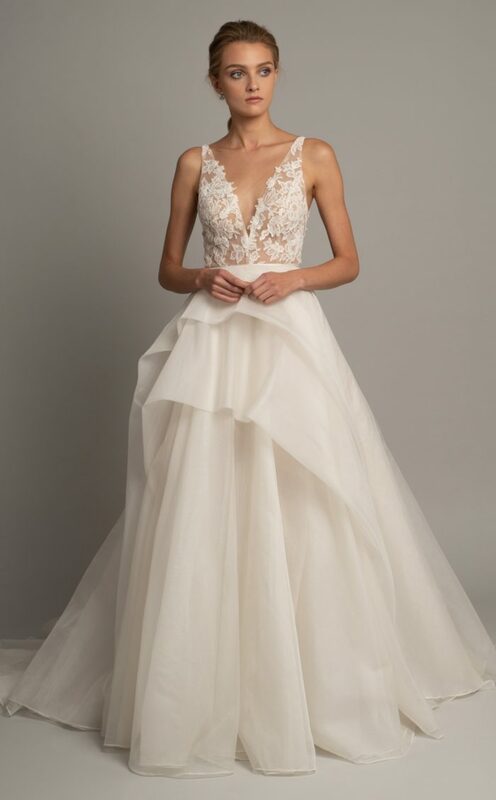 Volume comes in through through ball gown skirts – many of them with pockets – tiered layers, overskirts, and cape-like shoulder draping. These elements contrast perfectly with figure-conscious fitted sheath gowns that act as the base gown, or fitted bodices. 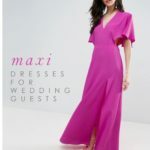 The necklines and backlines are also alluring, with off-the-shoulder styles, long sleeves, deep v backs and necklines, and floaty chiffon shoulder details. Jenny Yoo has aptly named this approach “structured femininity”, and the result is a collection full of depth and dimension. 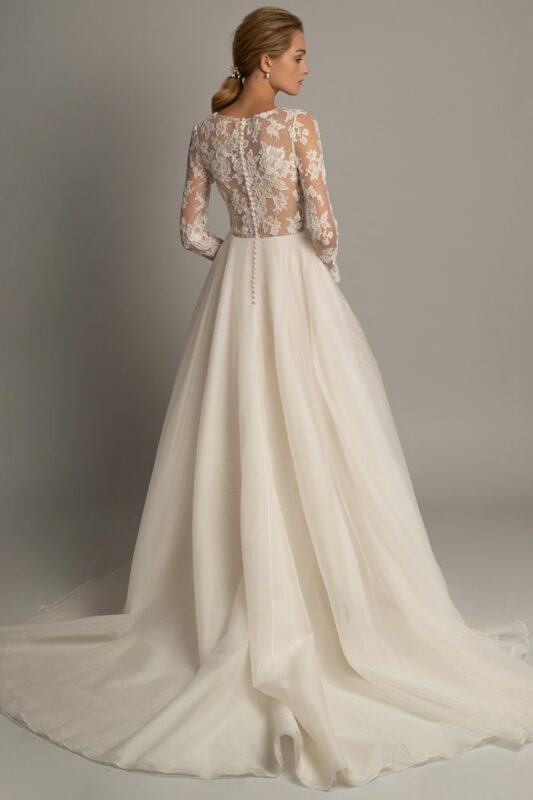 For more information on any Jenny Yoo Collection wedding dresses or bridesmaid dresses or to find a bridal boutique in your area that carries this line, please visit jennyyoo.com. We hope you’ll enjoy the photos of the lookbook of this latest Jenny Yoo Bridal collection by Marcy Castelgrande. 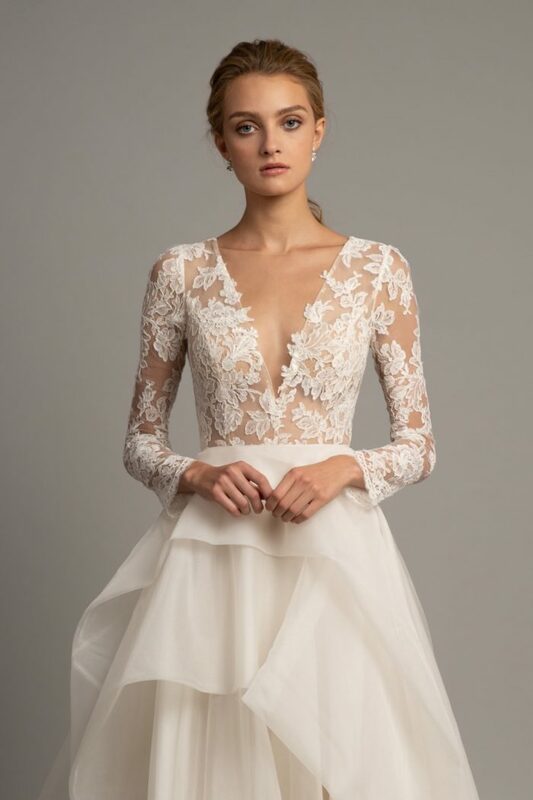 Jenny Yoo’s eponymous, elevated, and utterly romantic bridal collection highlights gorgeous details like mixed media of lace, tulle, and silk. Designing into luxe, European fabrics, Jenny focuses on a refined elegance of clean and linear silhouettes that add depth with sweeping trains and surprising V backs. 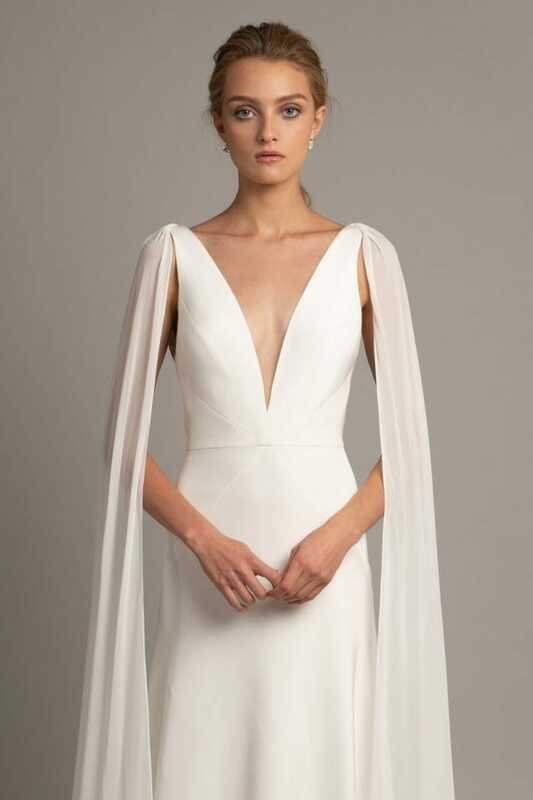 Jenny Yoo conceptualizes airy combinations of shapely silks, chiffons, and lofty organza that exhibit a suite of polished bridal gowns, both understated and breathtaking. Her modern, yet elegant, designs emphasize her philosophy that one must evolve with the footsteps of today’s changing times. 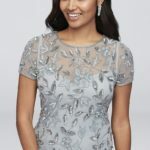 If you are smitten with these wedding gowns, you’ll also want to see our features of the Jenny Yoo bridesmaid dresses for Fall 2018, our look at the Jenny Yoo Collection 2018 Wedding Dresses and Bridesmaid dresses and our feature of Jenny By Jenny Yoo 2018 wedding dresses and our shop section for Jenny Yoo Bridesmaid Dresses.